What is the BC Vaporizer? When you burn herbs in a cigarette or pipe there are a lot of unwanted side effects from the high heat. The most distressing of these is the destruction and loss of active ingredients. Burning anything will produce all sorts of weird science and chemical by-products that you don't want in your lungs. What the Vaporizer does is different from any smoking device. Your herb is gently heated to the point where active ingredients are vaporized and released but never reaches combustion temperature. You avoid inhaling carbon monoxide, tar, and a lot of the bad chemistry. 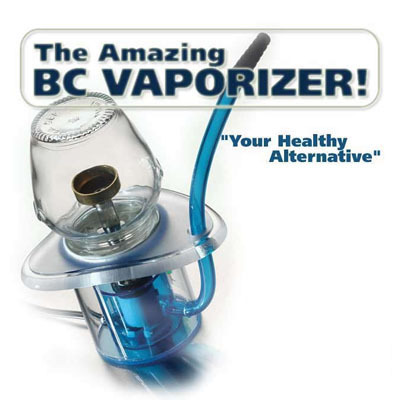 If you are concerned about the dangers of inhaling any sort of smoke.......The BC Vaporizer is Your Healthy Alternative! Herbs are frequently beneficial in the treatment of AIDS, Glaucoma, Cancer (chemotherapy treatment), Multiple Sclerosis, Epilepsy, Chronic Pain .......Many patients also report that herns are useful for treating arthritis, migraine, menstrual cramps, alcohol and opiate addiction, and depression and other debilitating mood disorders. In compared to the volcano vaporizer it is a much healthier to do its smaller dome!